On July 11, 1943 The Canadian Army First and Second Brigades landed on Sicily as part armed forces participating in the Allied Operation Torch. This operation, under the command of General Dwight D. Eisenhower, was a combined attack by the British Eighth Army, commanded by General Bernard Montgomery and the United States Second Army, commanded by General George Patton. The Canadian army forces were part of Montgomery's command. The Canadian Forces landed south of Syracuse on the southeast corner of Sicily at the southern end of the Straights of Messina. During the course of the next two weeks these forces moved inland to the northwest to the area of Leonforte to start a thrust eastward to Catania. While this was happening the British Forces who were moving along the coast from Syracuse to Catania were effectively halted in their advance by the terrain and the defenders. From Leonforte to Catania the Canadian forces faced heavy opposition from German forces that had been rushed into Sicily after the Torch landings. The Canadian advance was along highway 121, the main highway from Palermo to Catania. This highway runs, in the Leonforte/Agira area, along the crest of a ridge which is punctuated with various high points, one of which is Agira. The attack to the east was stalled at Nissoria, a few miles west of Agira. To break the impasse the Canadian commanders changed tactics from the "indian warfare" mode to a more set-piece attack behind artillery barrage. 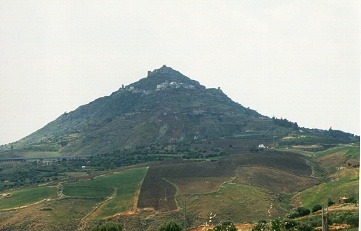 A few days later Agira was taken, the battle moved east to Regalbuto and gradually German resistance declined so that by August 17 Sicily was completely under Allied control. For details of the Canadian involvement in this campaign see "The D-Day Dodgers; the Canadians in Italy, 1943-1945" by Daniel G. Dancocks, McClelland & Stewart Inc., 1992, ISBN 0-7710-2544-0.